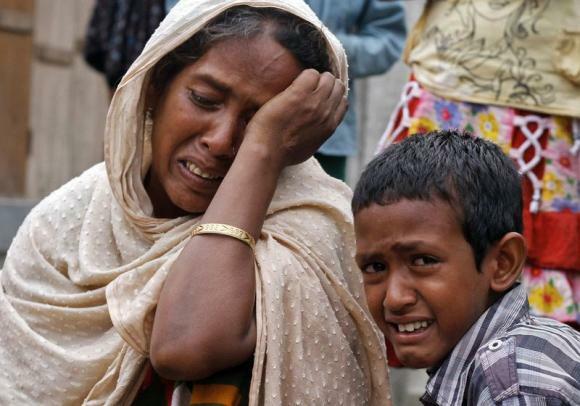 (Photo: REUTERS / Utpal Baruah / Files)Villagers from Muslim communities affected by ethnic violence weep at a relief camp in Narayanguri village in Baksa district in Assam May 4, 2014. GUWAHATI, India, May 7 (Reuters) - Indian police searched for at least a dozen missing people on Wednesday after finding seven bodies floating down river from a national park in Assam where Muslim villagers were killed in a massacre that has marred the country's general election. India is in the home stretch of a five-week election, which has heightened ethnic and religious tensions in some parts of the country, and in which a coalition led by the opposition Bharatiya Janata Party (BJP) could be within reach of claiming a parliamentary majority. The BJP has firmly condemned the violence, which it blames on the ruling Congress party. But the BJP's candidate for prime minister, Narendra Modi, has ramped up verbal attacks on illegal immigration by Muslims from nearby Bangladesh, drawing criticism from his opponents that he is stirring up trouble. The worst election violence was in the northeastern state of Assam, where at least 41 people were killed by suspected militants belonging to the Bodo tribe in three massacres last week believed to be revenge attacks after Muslims voted against the Bodo candidate. The brunt of the killing was in the village of Narayanguri on the banks of the Beki river and the fringes of the Manas national park, where masked gunmen burnt dozens of houses and shot more than 20 men, women and children. Villagers there insist more people are missing. "We have deployed SDRF (State Disaster Response Team) to search in the Beki river for those missing people," A. P. Rout, Assam's Additional Director General of Police, told reporters. He said villagers and police had found the remains of a six-month-old child and a 35-year-old woman, both floating in the river about 25 km (16 miles) from the site of the massacre that took place on Friday. Police later said five more corpses had been found floating in the river. The Manas park is a UNESCO world heritage site that borders the Himalayan kingdom of Bhutan and is popular with Indian and foreign tourists drawn to its dense biodiversity and tigers. The state chief minister, Tarun Gogoi, on Wednesday visited the sites of the killings and ordered a high level investigation.